Navigation: Weblog / Blog article: How Do Electronic Cigarettes Work? When someone sees you smoking some thing that is obviously not a cigarette the first thing they want to know is, “how do electronic cigarettes work?” The next question is almost always, “do they contain nicotine like a real cigarette?” I thought I would write a quick post answering these questions that I can link to all my other posts where it is useful. Do electronic cigarettes deliver nicotine? Yes. 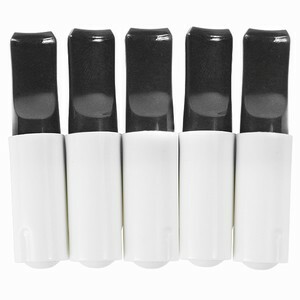 The refill cartridges contain nicotine in varying levels (zero, low, medium and high). They deliver about the same amount of nicotine as a regular cigarette. Notice that one level is “zero.” Some manufacturers offer cartridges with no nicotine whatsoever. 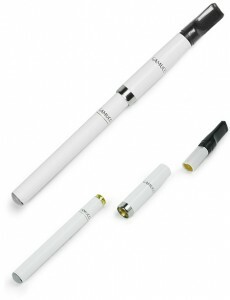 Basically, all brands of electronic cigarettes consist of 3 main parts: a battery, a nicotine cartridge and an atomizer. The batteries are typically lithium ion rechargeable that are powerful and compact. The batteries also contain some additional circuitry for lighting the tip that simulates the glowing “cherry” like that of a real cigarette. The nicotine cartridge includes a mouthpiece and a reservoir for the nicotine solution. The cartridges can be purchased in various flavors (tobacco, menthol, cherry, vanilla, etc.) and levels of nicotine (zero, low, medium, high). 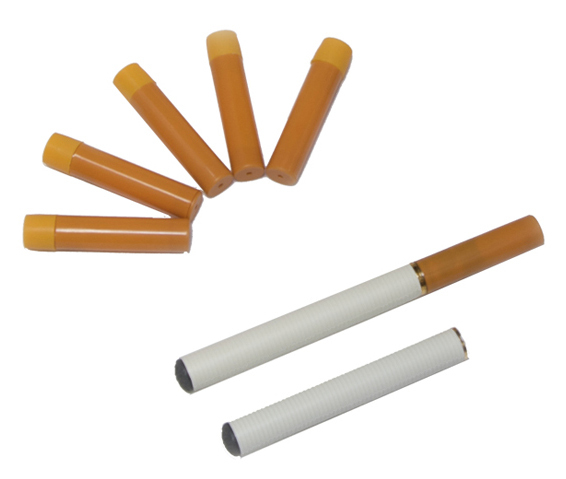 The nicotine solution in the cartridge mainly consists of water and propylene glycol which is a substance used in medicines, cosmetics, food, toothpaste etc. The only other ingredients include some flavoring and nicotine of course. The atomizer is activated when the user takes a drag on the device. The atomizer is a 2 part device. First, there is a “wicking” mechanism that is made out of metal. 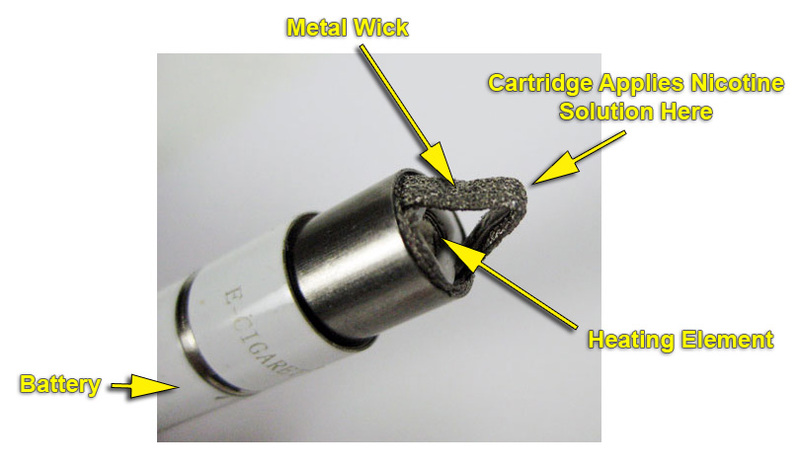 This wick comes into contact with the liquid nicotine solution in the nicotine cartridge and flows a small amount of nicotine solution down to the second part of the atomizer which is a heating element sometimes just called a filament. The filament is a small coil of high resistance wire that gets hot and vaporizes the nicotine solution flowing to it. This vapor in turn is what gets inhaled into the lungs. The picture above is of a 3-piece electronic cigarette design. The 2-piece type of electronic cigarette is a little different in its design, but the principle of operation is the same. You can read my article on the 3 types of electronic cigarettes if you want more information regarding pros and cons of 2-piece e cigs vs. 3-piece e cig designs. This post was very short and to the point but if you are looking for more information you have come to the right place just check the other posts or use the search option to find what you are looking for. And, if someone asks you, “how do electronic cigarettes work?” You can link them to this post as it is one of the most concise answers I have seen on the web. Real Evidence of Healthier Cigarettes?